A small rural community in upstate New York is being plagued by the disappearance of several of its members, along with a couple of mysterious deaths. One of the town drunk stumbles into the local bar and dies a horrible death due to a strange abnormality in his blood. The young, up and coming pathologist Don Tucker, under the supervision of his mentor and colleague Dr. Roy Anderson takes the case in their own hands to find out what caused the bizarre happenings.The two pathologists quickly learn that there is an abnormality in the blood found in the victims, that cause the blood to expand a 1000 times quicker than usual. At a farm outside of the quiet little community a band of maniacs has set up shop, harvesting the blood of the helpless locals to help revive their slumbering druid Queen of Sangroids, and for their own morbid appetites. As the redneck blood farmers attack more and more people in the little town the two doctors need to find a cure before it is too late. 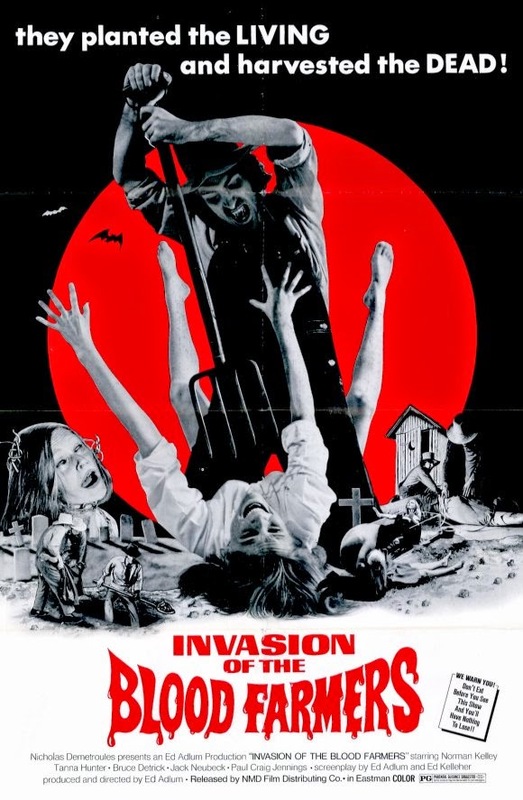 Invasion of the Blood Farmers... Just say it aloud once, doesn't that title just roll of your tongue? Besides from the fantastic title of the film, there really isn't that much more to this film, besides a couple of unintentional laughs. The plot is all over the place and takes a really long time to get wherever it is supposed to go. And the blood farming is unfortunately a bit tame, as most of the victims are clumsily beaten to death with a cane and drained of their blood with a plastic hose. And a druid sucking the blood out of a dog and hangs it upside down, where it looks suspiciously like a fluffy white boom mike smeared in blood. Gruesome stuff! In fact so gruesome that according to IMDB, this film was actually banned in Norway up to 2004, witch makes me wonder if the Norwegian Film board even saw this tame piece of trash. Most of the acting feels as natural as someone reading a script at gunpoint and much of the dialogue is laughably bad. There is also a lot of seemingly random close ups and jump cuts, very similar to the «technique» used by Doris Wishman in many of her films like Double Agent 73 and A Night to Dismember. Most of the music in the film sounds like it is stock, ripped from another movie, or a best of classical music record. This 1972 feature feels a lot similar to some of the other horror quickies produced in New York during that period. I was reminded of Michael & Roberta Findlays Shriek of the Mutilated as I watched this, and I discovered after watching it that writer/director Ed Adlum also wrote Shriek of the Mutilated. Both Findlays worked on this feature as well as editor and cinematographer. plus it would go great as a double feature with Shriek of the Mutilated.